• Great to hear from you. Tredd, Stacy, and Titus. • Congrats Dan !! Stacy and I been following your journey since we met you before the Great Smoky Mountains National Park on the trail.. well done Dan, well done !! Another day, another hike. Hasn't hit me yet that this is the end. • Congrats Daniel, I'm proud of you! • Just spent of week with a mutual friend of yours Roy Darden. So glad for you Daniel this has been an amazing journey for you and Kooper. A lifetime of memories has been made. Thank you for allowing All of Us to Live this out with you as you progressed in the Journey. May all of your Joys become complete in the one who holds all in His hands. Had my first clear view of Katahdin today. Sooo close. Watching the GT-UNC game from Lakeshore House in Monson, ME. Hope they send me off into the 100-mile wilderness with a win. Go Jackets! Two Thousand Miles. Spectacular views from on the Bigelows is my reward. • Pics or it didn't happen. First full day off since Vermont. 'cause the rain in Maine falls mainly as a pain. • Where are you on your hike? My hike is like the Lord of the Rings. But which of us is Frodo/Sam? 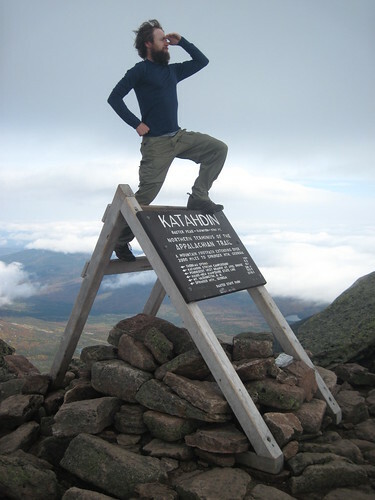 Hope I'm Frodo so Kooper carries me & my burden up Katahdin. is stealth-camping, like a ninja... a ninja with a huge bright yellow tent. And so begins my trek through the challenging White Mountains. Good news is it looks like sunny days all the way through. hmm, @kooper brings up a good point. His miles should count too. So I now have a blue progress bar for a new goal of 4356 miles/dollars! Thanks all who donated! http://onahike.com/forabby has reached the finish line! Wait, does this mean I have to match extra $ with miles? • what, do my miles not count!? Likes that Facebook's Places includes mountains. A few days ago I had my first bonafide thumb-out hitchhike. "Welcome to Vermont. The Long Trail. A footpath in the wilderness." First day of hiking I've enjoyed since... Virginia? Fantastic weather & scenery, no road crossings. Entered Mass & passed mile 1500. • Waahoo! That is great to hear Daniel. Congrats on the 1500 milestone, that is amazing. • Good Job! You are almost there, only 500 miles left... that can't be but a few weeks it seems the way you go. I saw a show on the AT and they said the white mountains were challenging. Sounds like you got through the "tunnel." Be safe and watch your step. is sick. Strange since lately I've only had tap water and eaten at restaurants/convenience stores. I think I'm safer in the woods. • Sorry to hear that. Feel better soon!! Back on the trail after exploring NYC and resting in NJ. Many thanks to the Illian family for being such gracious hosts! • Great talking with you the other night! You're doing awesome and have already accomplished so much! Love you big brother! 2 bears, 1 turtle, 0 rattlesnakes, and 1 steakhouse. Not a bad day. Amy Holland has a hiker shuttle service and also raises Vizslas. Kooper gets a day off playing with pups and I get to slack-pack! Carrying 3 liters of water and 1 liter of sweet tea. Both are hard to come by in Pennsylvania. It was a marathon hike (26.2 miles) but I made it thanks to cloudy skies and trail-angel Mossy Brown's cold drinks & slackpack. • eeeeek! So coool! You hav made it way farther than I thought u would.... Just being honest ;-) U r a machine!!!! • 0.0115 to be exact. That extra 0.0015 makes all the difference. And it was all pain. Stepping across the Mason-Dixon line. Staying at Bonzo's. He has the AT tatooed on his back, 'nuff said. Oh, and Baltimore Jack says he might make us a "bacon explosion". • Pig + dynamite? Very appropriate for Indpendence Day!